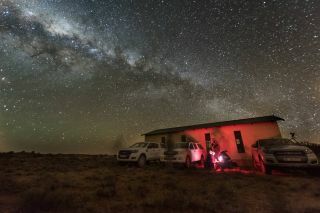 Paul Maley and Ted Blank, members of the International Occultation Timing Association, observed the occultation of Kuiper Belt object 2014 MU69 on the morning of June 3, 2017, from the Karoo desert near Vosburg, South Africa. Their target field was in the constellation of Sagittarius. The team behind the New Horizons space probe's historic close flyby of Pluto recently pulled off a challenging observation of the spacecraft's next target. On the night of June 2, the mission scientists pointed dozens of ground-based telescopes toward an object called 2014 MU69, which lies about 1 billion miles (1.6 billion kilometers) beyond Pluto. The team was watching carefully as the object crossed in front of a distant star (an event known as an occultation), illuminating the region immediately around MU69 for just 2 seconds. The feat was "the most technically challenging and complex stellar occultation observation campaign ever attempted," according to the NASA statement. The event was visible from a limited region on Earth that included Argentina, South Africa and a large swath of open ocean. In Argentina, New Horizons scientist Alex Parker sets up a telescope to begin collecting data on the stellar occultation of 2014 MU69 on the night of June 2, 2017. The New Horizons team was able to obtain observation time on more than two dozen fixed-based telescopes inside the occultation visibility path, but bad weather could have easily obscured the view from any of those locations. So the team also brought another 25 portable telescopes into the viewing area, according to an earlier statement. The telescopes were separated by anywhere from 6 to 18 miles (10 to 29 km) to increase the odds that at least a few of them would capture quality data. But in the end, all 54 telescope teams reported collecting data, according to NASA. "A tremendous amount had to go right to correctly execute such a massive observation campaign, but it did," said New Horizons principal investigator Alan Stern, of the Southwest Research Institute in Boulder, Colorado. "The main goal of these observations was to search for hazards; the secondary objective was to try to glimpse the occultation of MU69 itself, in order to learn its precise size. Scouring all the dozens of datasets for these two objectives is going to take us a few weeks." Four members of the South African observation team scan the sky while waiting for the start of the 2014 MU69 occultation, early on the morning of June 3, 2017. They used portable telescopes to observe the event, as MU69, a small Kuiper Belt object and the next flyby target of NASA’s New Horizons spacecraft, passed in front of a distant star. Scientists discovered MU69 in 2014, but much about it remains unknown, including its specific orbit, according to the statement. The researchers are using data from the Hubble Space Telescope and the European Space Agency's Gaia mission to try to pin down the path of this space rock, and with data from those two missions, the scientists were able to predict when and where the June 2 occultation would be visible. MU69 will eclipse a background star twice more this summer, on July 10 and July 17. These occulations will provide two more chances for the New Horizons team to observe MU69 eclipse a background star this summer. For the July 10 occultation, the team will utilize the Stratospheric Observatory for Infrared Astronomy (SOFIA), a joint project between NASA and the German Aerospace Center that consists of observation equipment mounted on a high-altitude airplane. SOFIA can observe occultation events while flying over the open ocean and goes above clouds that would obscure the view from the ground. SOFIA has also been used to observe Pluto's occultations of background stars. For the July 17 occultation, the New Horizons team will once again rely on mobile, ground-based telescopes positioned in the Patagonia region of Argentina. On that day, MU69 will eclipse a particularly bright star, which should allow the researchers to see even more potential debris in the area around the object. The New Horizons probe zoomed past Pluto in July 2015, and in July 2016, it was approved for a second mission to fly by 2014 MU69.